Gold Cup in St Tropez…13th-20th Oct. Calling all Dragon’s, Entry for Gold Cup closes soon, please join the fun in St Tropez. Almost 70 boats are already entered for the 2017 Gold Cup!! This will be a most spectacular event to round off our excellent season… As part of this years organising committee I can assure you all that no stone will be left unturned in our pursuit to give all participants the ultimate regatta. Racing will take place outside the Gulf of St Tropez to allow for excellent courses. Principle Race Officer Phillip Faure will be calling the shots, whilst I will be announcing VHF information throughout the event. Courses will be set outside the Gulf of St Tropez to allow for 2.5 nautical mile Upwind leg’s with well set start lines of a sensible length. 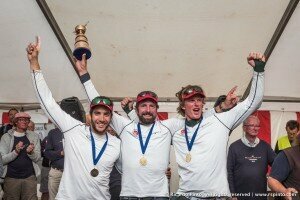 Winners of the 2016 Gold Cup, SUI 311 “Sophie Racing” Bernardo, Hugo & Martin. In Denmark. The S.N.S.T. look forward to hosting this prestigious event which offers one quality race per day over 6 race days with no discard. First race Sun 15th..
Higher, Faster, Longer……… Stavros. (On the Committee Boat).